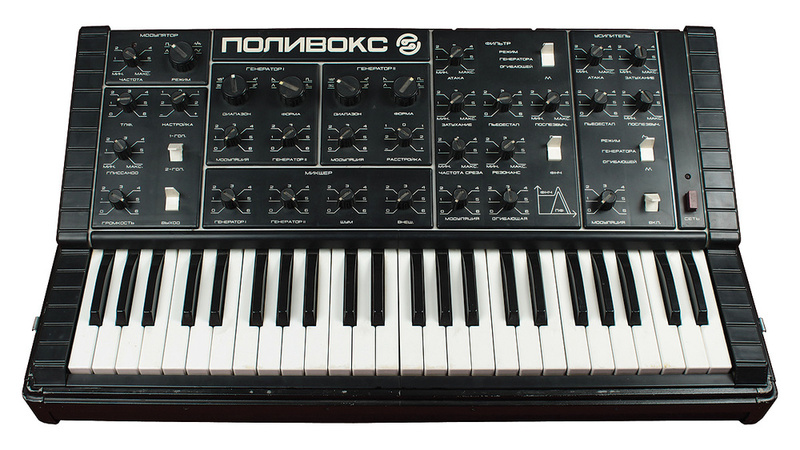 I saw my first Russian synthesiser in July 1994, at the opening of Martin Newcombe's now defunct Museum of Synthesizer Technology. I was intrigued by it. Many of the guests were twiddling away on large Moogs and ARP 2500s, but I didn't even know that there was (or had been) a Russian synthesizer industry, so I asked Martin whether I could try the thing with the strange Cyrillic name. Crushingly, the answer was "no”, because it didn't work. Nevertheless, it looked gorgeous: black, chunky, and about as sleek as a Soviet tank. The instrument in question was a Polivoks and, at the time, the museum's was perhaps the only one in the UK. But Martin had unwittingly started something and, fuelled by rumours that Russian synths had a raw, aggressive sound, interest in them rocketed. 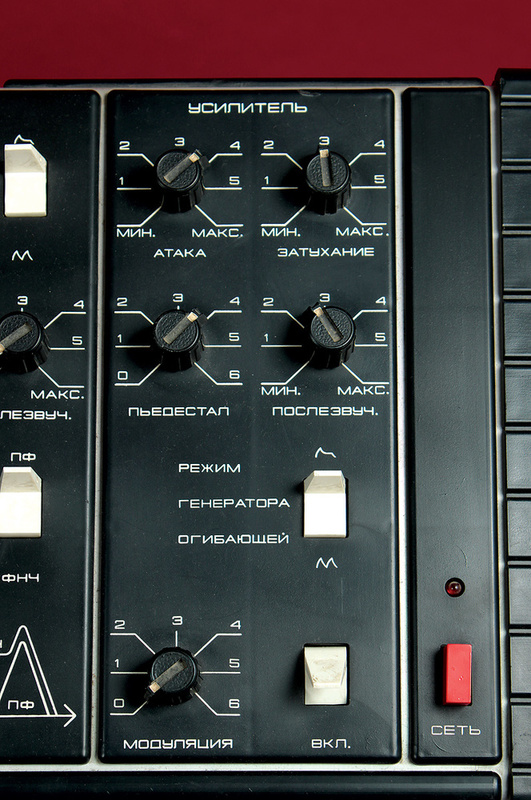 Happily, the Soviet Union had collapsed a few years earlier, so the time was ripe for all manner of Russian and East German synths to enter the western consciousness. The problem was that nobody knew where to find them, so by 1995, they were already well on their way to acquiring mythical status. 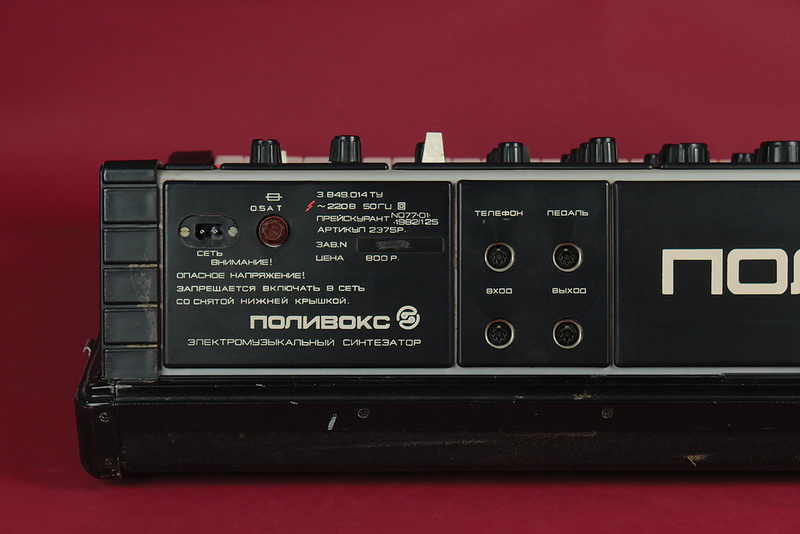 The Polivoks is a duophonic synthesizer designed by Vladimir Kuzmin, an electronics engineer who had been the bass player and sound engineer in his student band. Having graduated in 1976, he was inspired to apply for work at the Urals Vector Company by the inventor of the FAEMI, the first commercially successful Russian electronic keyboard. That man was Vladimir Lugovetz, the Director of the bureau that controlled development of electronic instruments at the Vector company, and the father of Kuzmin's future wife. The Polivoks' three outputs and one input are all on DIN sockets, including the headphone out. 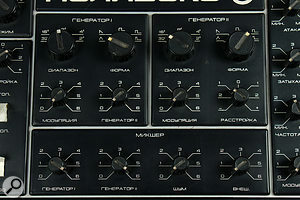 Perhaps unexpectedly, the main output (bottom right) is actually balanced.Five years later, when the powers that be decided to extend the Formanta range to include the first voltage‑controlled analogue synth manufactured in the USSR, Kuzmin was asked to head a small team of engineers to design it. He accepted, and set to work with his wife, Olimpiada Kuzmina, who was responsible for the physical design and panel graphics, and hardware engineer Yuri Pheophilov. 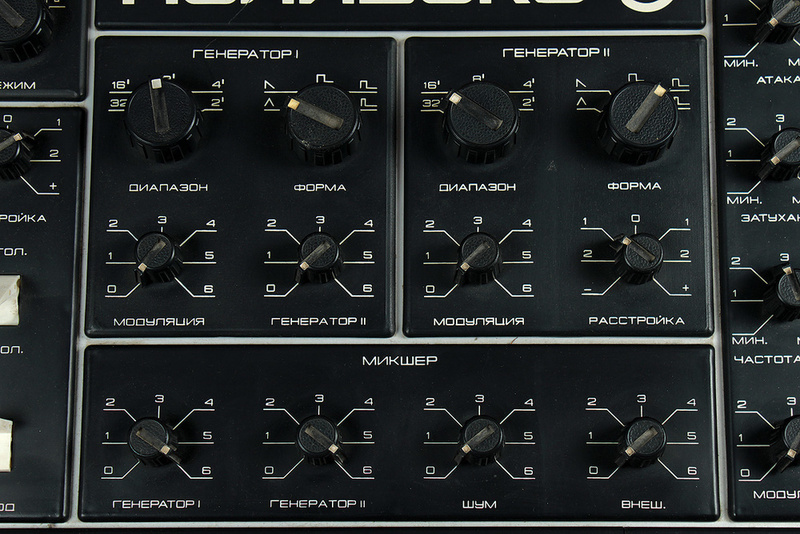 Kuzmin decided to adopt a modular approach to the Polivoks: each of its sound‑generating sections would exist on its own circuit board, and these boards could then be inserted into a backplane, much like the configurable minicomputers of the era. This would allow boards to be changed and updated, as well as making it possible to use them in other products. To facilitate this, Olimpiada spaced the controls widely to accommodate the modules beneath, which had additional benefits in manufacturing and servicing. On the other hand, the Polivoks could have been significantly smaller had an integrated approach been adopted throughout. 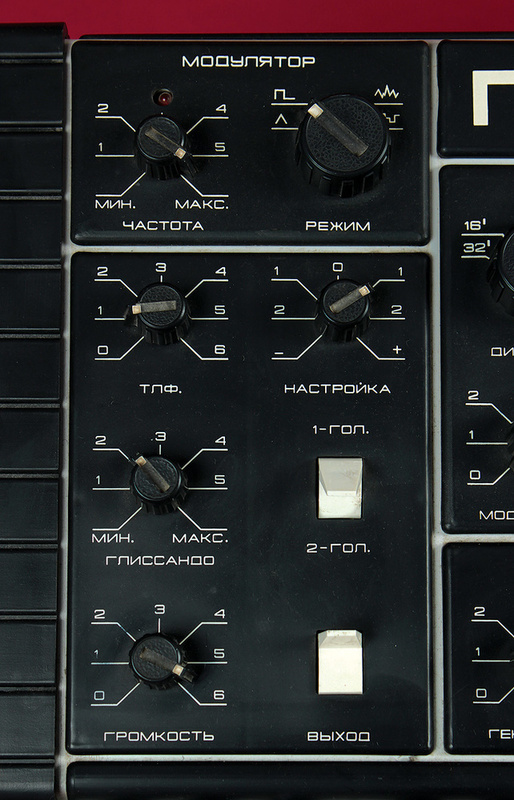 However you interpret these conflicting views, it's clear that the Polivoks is not a copy of any existing synth, although it utilises well‑understood building blocks and you're unlikely to be flummoxed by one even if you're unable to read Russian. The centre of its panel is dominated by two audio‑frequency oscillators. The Polivoks' two VCOs (top) are identical, except that VCO1 (left) can be cross‑modulated by VCO2, and VCO2 can be detuned. The four knobs at the bottom control the relative levels of the two oscillators, the noise source and the external input. VCO1 offers five octaves from 32' to 2', five waveforms, and controls for LFO modulation level plus Osc 2 cross‑modulation for monophonic FM synthesis. VCO2 offers the same selection of footages and waveforms, an independent control for modulation depth, plus fine‑tuning. Underneath these lies the mixer, which offers level controls for the two oscillators, the noise generator, and for audio injected into the external signal input. 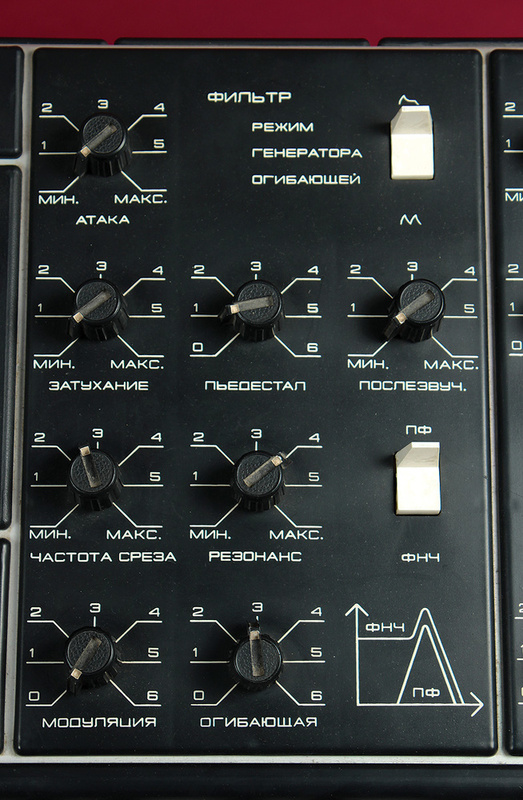 Yes… the Polivoks could be used as a signal processor, long before this became fashionable. To the right of these, you'll find the filter, and this is where the Polivoks starts to become interesting. Eschewing conventional designs, Kuzmin decided to develop his own filter topology, and after a year's research he chose a simple 12dB/octave device with just eight components: two op‑amp ICs and six resistors. This circuit — which offers both low‑pass and band‑pass responses — flies in the face of conventional wisdom which states that analogue filters must include capacitors to function. 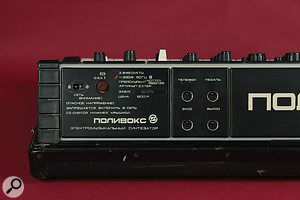 But Kuzmin had taken advantage of the capacitance within the op‑amps themselves, and the result was a unique device with a harsh and heavily distorted character that bore no resemblance to the 24dB/octave filters in the Minimoog. In retrospect, this decision seems strange, since it has been documented elsewhere that Kuzmin's instructions were to build a synthesizer that could emulate existing American instruments. To be fair, an update in 1985 or thereabouts eliminated a little of the nastiness but, to most ears, later models sound little different from earlier ones, and nothing like an American synth, Moog or otherwise. The Polivoks' notorious filter section. The top half is a standard ADSR envelope — until you flip the switch, when it becomes a repeating AD envelope instead. The four controls at the bottom adjust (clockwise from top left) cutoff, resonance, envelope mod and LFO mod. As well as responding to the LFO and a control-pedal input, the filter has a dedicated contour generator with two modes: a standard ADSR envelope, and a repeating mode that generates a triangular waveform determined by the Attack and Decay settings. The same architecture is provided for the audio VCA on the far right of the panel, but there's an extra switch here that has been described on the web as both a VCA envelope 'defeat' and a key‑follow on/off. It's neither. It's a Gate On switch, which allows you to use the Polivoks' filter as a signal processor and to create rhythmic sounds using the two envelopes in repeat mode without the need to press a key. Indeed, this is one of the most intriguing aspects of the Polivoks, because you can set up the attacks and decays of the two contour generators in such a way that you obtain regular, repeating polyrhythms. You can even spice these up further using the sample & hold setting in the LFO to create pitch and filter changes that stay in time (or not) with the repeating patterns from the contour generators. Ah yes… the LFO. To the left of the instrument there's a modulation section and a master control section. The former comprises the dedicated LFO, which offers four waveforms, including noise, and a stepped function for sample & hold effects. The latter includes the master tune, master volume, master output on/off switch, a volume control for the headphone output (labelled 'telefon'), and the glide control, which only affects VCO1 and is therefore capable of some novel effects. The final control on the front panel switches between monophonic and duophonic operation. The Polivoks' other ADSR is hard‑wired to the VCA, along with another LFO mod control (bottom). Again, the envelope can be switched to a repeating AD mode, providing some of the instrument's most distinctive effects. As on most other duophonic synths, this allows you to play the oscillators separately, but there is only one signal path, so it's not possible to shape notes independently. Also, as on the ARP 2600 and Odyssey, the upper note drops to the lower if the second note is released, which makes it difficult to use the Polivoks to play two lines simultaneously. Having had my interest piqued by Martin's dead synth, the first two Polivokses I saw for sale were advertised on a synth forums in July 1997 by a gentleman named Vlad. He was asking $350 for each (a bargain by current standards) and he sold both to a chap in the USA named Tom Moravansky. I didn't see any others advertised until 2000, about the time that I first made contact with Maciej Polak, who would eventually sell me my own Polivoks. 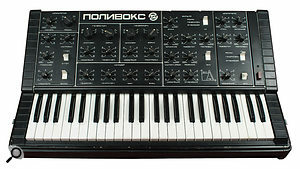 However, the first synth that he sold me was not a Polivoks but an East German monosynth. As you can imagine, I was nervous about buying blind from an unseen presence on the 'net, but I transferred my money, and in due course the synth arrived, exactly as described. Score one for the good guys! My first impression was of a brute of a synth that might have survived a direct strike from a Minuteman missile. It came in a metal case (rather than the tolex‑covered chipboard of American and Japanese instruments) and Olimpiada Kuzmina had intentionally made it look chunky to emphasise its quasi‑military background. Unfortunately, I soon found that appearances can be misleading. The case is quite flimsy and its clips break too easily. Furthermore, the plastic end‑pieces of the synth hold the whole thing together, and if these crack where they bolt to the lower part of the case, the bottom of the synth drops off! Nonetheless, unlike Martin's, my Polivoks worked and, despite the scare stories above, it has developed only one fault in the years that I've owned it: a single dead key. 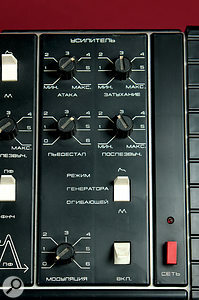 On most monosynths, this would indicate a dirty or broken contact, but not on the Polivoks, which uses magnets glued under each key and magnetic reed switches as key contacts. On mine, one of these switches had failed, but I found a modern equivalent that fitted perfectly. Similarly, when I had a somewhat more sickly Polivoks repaired professionally, David Croft at the Synthesizer Service Centre was able to use modern components to fix faults in its filter and filter envelope generator. Indeed, I have yet to hear of an irreparable Polivoks and, given its discrete architecture, it will probably be possible to repair them long after a lack of dedicated chips has rendered many modern workstations obsolete. When I switched on my Polivoks for the first time, I was uncertain what I should expect from it: would it be useable as a melodic instrument? Happily, my fears turned out to be unfounded. Sure, it's highly unstable at times, and its wobbly and scratchy pots mean that it will sometimes wibble off into its own sonic territory. Furthermore, it's never going to produce the superb brass or flute sounds of an ARP, nor the creamy leads of a Minimoog, nor even the thinner and more compliant sounds of early Rolands and Korgs. But when it comes to wicked screams and aggressive bass patches, the Polivoks is unsurpassed. Turn the oscillators' output levels to maximum to overdrive the filter input and crank up the resonance, and every sound becomes abrasive and distorted. Played this way, a Polivoks will produce raw sounds that you'll not obtain from any American, Western European or Japanese monosynth of the era. This character accounts for the synth's rise in popularity throughout the '90s. In the era of hard techno and Berlin‑school industrial, the harshness of the Polivoks was what some musicians craved. Mind you, it was not universally liked, and Kuzmin admits that some of the comments made while it was in production were less than complimentary. If there is one area in which this criticism was deserved, it's regarding the Polivoks' 48‑note F‑E keyboard. While it seems that this was designed to a Russian standard that determined the appropriate length of travel and the amount of force needed to play it, the keys feel horrible, their travel is remarkably shallow, and they clatter unpleasantly. In fact, the Polivoks has the worst keyboard I've ever played, and its yellowed keys look like they've been smoking three packets of Woodbines a day for the past 20 years. Oh, and while I'm complaining, I have to mention the lack of a modulation wheel or joystick. 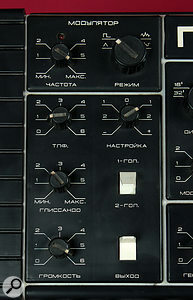 Given that Kuzmin was attempting to design an alternative to the likes of the Minimoog, this was a shocking oversight. What more could I possibly add? Numerous other keyboards and synthesizers were developed at Katchkanar, some bearing the Formanta name, others not. The Polivoks was followed by the Maestro polysynth and the Arton VS34 Vocal Synthesizer, which produced vowel sounds using formant synthesis. But my favourite of the early Formantas is the Kvintet, a string synth that also produces 'vocal' sounds. Despite its agricultural looks, it sounds gorgeous. Less gratifying are the battery‑powered FAEMI Mini, the FAEMI‑1 organ and the FAEMI‑1M paraphonic synthesizer. 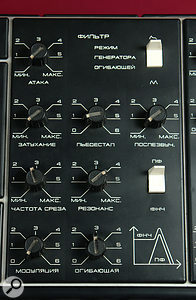 The FAEMI‑1 used an unusual architecture with 12 master oscillators and 12 sets of octave dividers (as did the rather more successful Korg PS‑series polysynths) while the 1M employed the more common single‑master‑oscillator design, but added a single VCF similar to that in the Polivoks. Moving into the digital age, there was the Arton IK51, a wavetable‑based polysynth. Kuzmin claims that this had a very natural sound, close to that of a sampler, but with controllable parameters and a memory requirement of just 256 bytes per voice. Unfortunately, it was never completed, and just one prototype was built. The team also designed drum controllers, drum sound generators and sequencers, some of which reached the market, and some of which did not. The name 'Polivoks' has been translated into English in numerous ways. In defunct UK magazine The Mix it was called a 'Polyrock', but it's clear that the Cyrillic characters spell out 'Polivoks' or, at a pinch, 'Polyvoks'. Nonetheless, that hasn't stopped many people from truncating the name from eight letters to seven, choosing to call the instrument a 'Polivox' or 'Polyvox'. Either way, the name was never intended to suggest that the synthesizer was polyphonic. In Russian, the implication is one of multiple timbres (or 'voices'), not multiple notes. Eventually, there were four types of Polivoks. I've mentioned elsewhere that there were pre‑ and post‑1986 models defined by changes to the filter, but there was also a cosmetic variation; Olimpiada had specified that units could be built using either white or brown switches. Whichever version you have, the synthesizer is essentially the same. Trimmers to adjust the pitch and scaling of each oscillator lurk beneath the main nameplate. What do you do if you can't get your Polivoks to play in tune across the full width of the keyboard or at different octaves? At first sight, there's no way to tune and scale it, and this might tempt the brave (or stupid) to open it up and start poking around. Happily, there's a much simpler solution. If you pop off the plastic plate bearing the Polivoks name on the control panel, you'll find six trimmers, three for each of the oscillators. Let the synth warm up and follow the instructions, and it should tune without problems. Furthermore, because the Polivoks's oscillators are thermally stabilised, it should stay in tune afterwards.